Food Allergy Awareness month may not be until next May, but for those who would like to help raise awareness as we near Halloween—a night when children will be going door to door collecting treats by the bagful—will have at least two opportunities to promote food safety and awareness in their communities by taking part in the Food Allergy Research and Education (FARE) Teal Pumpkin Project. 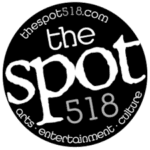 Originally launched as a local awareness activity in Tennessee, the Teal Pumpkin Project went national with FARE in 2014 and has since become an international movement, reaching all 50 states and 14 countries last year. According to the project, 1 out of every 13 children has food allergies and they send someone to the emergency room every three minutes. A 2013 study done by the Centers for Disease Control and Prevention found that food allergies among children increased approximately 50% between 1997 and 2011, the cause of which has not yet been identified. In an effort to include those children in the fun of Halloween trick-or-treating, households are encouraged to place a teal pumpkin in front of their homes to signify that they also have non-food treats, such as glow sticks or stickers, to offer children with food allergies which prevent them from eating traditional Halloween candy. Bethlehem High School senior Lindsey Stento lost her friend Natalie Giorgi to a peanut allergy when Giorgi was only 13 years old. “She passed away three years ago,” said Stento, “and we would always do the walk for food allergies with FARE (the most recent took place on the first of October), and I was looking into doing more for food allergies and I found the Teal Pumpkin Project.” Teal, Stento explained, “is for food allergies as pink is for breast cancer.” So, last year, she was able to acquire 50 pumpkins at a discounted price from Hewitt’s Garden Center in East Greenbush, and she got a group of friends together to paint and distribute them throughout her neighborhood. “There was one on every doorstep,” she said proudly. “And so this year, I wanted to go a step further.” This year, said Stento, she managed to get 100 pumpkins, all donated this time (thanks, she said, to the Slingerlands Price Chopper, the Glenmont Hewitt’s and Trader Joe’s in Colonie) and, as well as distributing them throughout her immediate neighborhood, she will be selling them at the Delmar Farmers Market at Bethlehem Middle School on October 22, for $5 a piece, to any one who wants to show support. Proceeds will go to support food allergy awareness and research. “Normally,” Stento continued, “people don’t realize on Halloween the allergies that people can have; it’s a thing that people look past and they just hand out candy. FARE definitely helped to put out the idea that there should be non-candy treats so that people who do have allergies are able to still go trick-or-treating and not worry. Stento particularly appreciated the relationship she established with Trader Joe’s. “They’re all about organic and healthy and so the manager that I dealt with loved the idea,” she said. He not only supported her cause, she said, but also gave her organic, “allergy-free” lollipops made with a limited amount of typically non-allergenic ingredients. 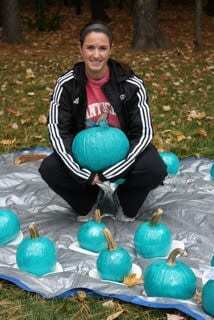 One week after Stento will be selling her teal pumpkins at the Delmar Farmers Market, on Saturday, Oct. 29, the Guilderland Center Rehabilitation and Extended Care Facility, located at 428 Route 146 in Altamont, will host its first annual Guilderland Center Trick-or-Treat Spooktacular in partnership with the Teal Pumpkin Project. “Food allergies are a life-altering and potentially life-threatening disease, and a growing public health issue,” said Guilderland Center Rehabilitation and Extended Care Facility Admissions Coordinator Wendy Decker. “For these children, even a tiny amount of their allergen has the potential to cause a severe reaction. Staff at the Guilderland Center Rehabilitation and Extended Care Facility prepared for their first teal-tinted Spooktacular celebration // Photo provided. The haunted afternoon will feature a costume contest with prizes by age group and trick-or-treating throughout the facility, collecting devilish delights along the way. Halloween bags will be provided for children to collect their treats while supplies last. Anyone wishing to learn more about the Teal Pumpkin Project or how to manage food allergies, advocate for those who have them, learn about the current research or simply to donate to FARE should visit their website at www.foodallergy.org. Alternately, donations can also be made through the Natalie Giorgi Sunshine Foundation at nateam.org.